President Hage Geingob of Namibia with Chinese President Xi Jinping following their bilateral meeting during the Forum on China–Africa Cooperation in Beijing. 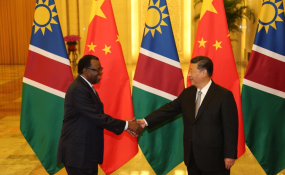 Beijing — It is a great honour for me to address you as Chairperson of the Southern African Development Community (SADC) and of course, as President of the Republic of Namibia, at this High-Level Dialogue between Chinese and African Leaders as well as Business Representatives. I wish to express our sincere appreciation to the Government and people of the People's Republic of China for the warm reception accorded since our arrival in the historic city of Beijing. This Summit of the Forum on China– Africa Cooperation (FOCAC) takes place 3 weeks since SADC held its 38th Ordinary Summit of the Heads of State and Government in Windhoek, Namibia, under the theme, "Promoting Infrastructure Development and Youth Empowerment for Sustainable Development." FOCAC provides an excellent platform for dialogue between China and Africa. This gives us a good opportunity to discuss the main issues that were considered during our Regional Summit, including industrialization and empowerment of youth, and maintaining peace and security. For trade liberalization to contribute meaningfully to sustainable development, poverty reduction and job creation, it must be complimented with the requisite capacities to produce, and to trade efficiently and effectively. It is for this reason that SADC has developed the Industrialization Strategy and Roadmap 2015-2063. Given China's renowned track record of industrial development and technological advancement, SADC wishes to leverage our relationship through FOCAC, in order to advance technological transformation in our region. supporting projects in priority sectors such as manufacturing, infrastructure, transportation, agriculture and tourism. Along with the profiling of the priority sectors and subsequent value-chain development, there is also a need for support in the development and promotion of Special Economic and Development Zones, and Industrial Clusters as a key to encouraging technological development and innovation. It is a fact that Africa has the youngest population in the world, and it's growing at a rapid rate. According to the UN report in 2017, the continent's youth population (aged 15-24), is expected to be more than double that of 2015, totaling 226 million by the year 2055. This "demographic dividend" is an asset for the continent. Alongside abundant natural resources, this young population offers enormous potential as the engine for growth in our region. It is against this background that our region sets the youth as a priority to advance regional integration. The theme of the 38th SADC Theme demonstrates that commitment. The youth needs to be empowered through harnessing of skills, and entrepreneurship development. For our youth to be the drivers of our industrialization agenda and economic development, they have to develop the requisite competencies and capacities. We are confident that through FOCAC, we will develop a mechanism to support the development of our young people. The SADC region has made significant strides in terms of youth empowerment, through on-going regional initiatives in education and skills development. One of these is the Technical and Vocational Education and Training (TVET) Framework and Implementation Plan 2018-2027. This is intended to augment the SADC industrialization process through provision of adequate and relevant skills for industry competitiveness and increased access to skills programs, in order to ensure the meaningful participation of young people in the industrialization agenda. The need for youth empowerment, comes at a time when the 4th Industrial Revolution has made its impressive entry within societies and even the human body, through a number of fields, including robotics, artificial intelligence, nanotechnology, quantum computing, biotechnology, to mention but a few. I would like to invite the Chinese Business Community and Investors to contribute to youth empowerment in SADC by promoting business and investment in the areas of Research and Development, Innovation, Science and Technology. Our gracious host, His Excellency Xi Jinping, has described China as a country which will remain the "builder of world peace, a contributor to global development, and upholder of international order." As I conclude, I wish to recognize the People's Republic of China's significant contribution to the advancement of the SADC regional agenda and the African development agenda. Alongside the Frontline States, plus Nigeria, China supported us during the first phase of our liberation struggle. Our Chinese friends are with us as we intensify our efforts in the second phase of our struggle, that of economic development. SADC stands ready to join hands with China under the solidarity of our all-weather friendship, to build world peace, to contribute to global development and to uphold international order. Copyright © 2018 Government of Namibia. All rights reserved. Distributed by AllAfrica Global Media (allAfrica.com). To contact the copyright holder directly for corrections — or for permission to republish or make other authorized use of this material, click here.